10 November 2017, Philippines – Predator Gaming has announced the Asia Pacific Predator League 2018, its brand new DOTA:2 league and the most anticipated eSports competition. The Philippines joins the action together with 7 other countries as it begins its first Regional Qualifier in Bukidnon on November 18. The emerging victor of the Philippine Qualifier will be heading to Indonesia to compete for the $150,000 prize pool. The most anticipated eSports competition, Asia Pacific Predator League 2018 is set to hold elimination rounds in 7 countries in Asia Pacific, namely Singapore, Malaysia, Thailand, India, Hong Kong, the Philippines, and Indonesia, where the final round will be held. “We started our Predator gaming line around two and a half years ago, and within those two years, we have successfully reached first place in several countries. This is definitely a good starting point for us, and today we are proud to present the most anticipated eSports tournament in Asia Pacific that could take you to the next-level gaming experience with Predator,” said Andrew Hou, President of Predator Gaming Pan Asia Pacific Region. “Predator League is a milestone for Predator Gaming and is a testament to our relentless pursuit of innovation and technological excellence, and our commitment to delivering best-in-class experiences to gamers without compromise.” he added. The first elimination round of the Predator League will be conducted in each country, and will last for approximately 3 months (until January 2018). The Philippine Leg consists of 4 Regional Qualifiers, each with a prize pool of PHP 30,000, and the National Finals, with a prize pool of PHP 100,000. The Regional Qualifiers will be held in various areas of the country, namely Mindanao (Bukidnon), Visayas (Bacolod), North Luzon (La Union), and NCR (Marikina). Winners of these qualifiers will move on to compete at the National Finals. The victor of the National Finals will then represent the Philippines in the Predator League final round, and will compete against the national winners of the other APAC countries for the total prize pool of $150,000. “The Philippines has such a robust local gaming community and we continue to see tremendous growth. Still, we feel that there is so much potential just waiting to be tapped. With Predator League 2018, we hope to be able to harness this potential and unlock even more opportunities for amateur Filipino gamers starting with Asia, and eventually also all over the world,” Dio Vasquez, Director for Product Management of Predator Gaming Philippines said. In the Philippines, the Predator League 2018 eliminations are done with THENET.COM (TNC), the gaming company’s regular e-Sports partner. 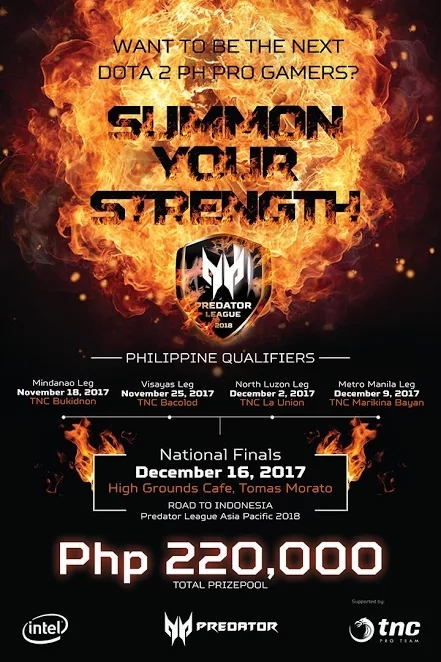 Predator League 2018 is also supported by the Philippine DotA pride, TNC Pro Team - DotA 2. “TNC and Predator have always been allies in promoting e-Sports in the Philippines, and TNC has always enjoyed Predator’s support from the conception of High Grounds Café, TNC’s e-Sports café, to the TNC DotA 2 competitions. We have big plans for e-Sports scene in the country, and we are confident in that together with Predator, we will take gaming to greater heights,” said Eric Redulfin, General Manager of TNC. For further information about Asia Pacific Predator League 2018 campaign, visit https://predator-league.com/.